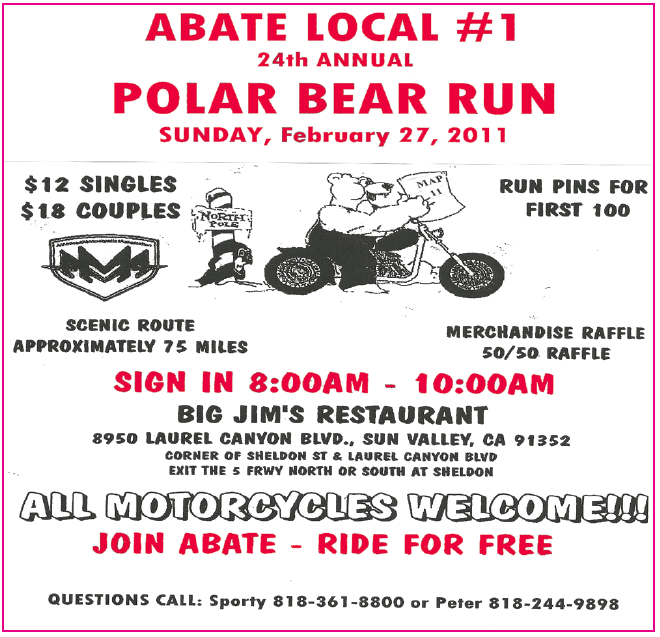 For those of you who are looking for a ride this weekend, I would encourage you to check out the ABATE 24th Annual “Polar Bear Run” this Sunday, February 27, 2011. The ride raises money for ABATE of California. If you ride motorcycles and you aren’t familiar with this group, well, these are the men and women on the front lines, fighting the anti-motorcycle legislation that comes up in Sacramento every year. The kind of laws they fight range from smog checks and limitations on after-market equipment, to engine-displacement restrictions for younger riders, to motorcycle-only check-point laws, to attempts to cut funding on motorcycle safety programs that are proven to reduce the number of motorcycle accidents and save lives. As a motorcycle accident lawyer and a fellow rider, I know first-hand the difference these folks make for motorcyclists in California. The cost is just $12, or $18 for couples. Most of the men and women who come out for these things are on Harleys. But all bikes are welcome, and I’ll be on my Suzuki GSX 1100. I’d love to see some guys and ladies riding European and Japanese bikes come out for this, too. It’s time for those of us younger riders to stop sitting back and having the old timers do all the work, while we do nothing to keep riding legal. See you there.